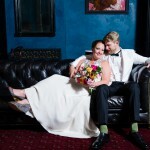 Erin & Bob envisioned their big day to be intimate and casual, yet sophisticated. With the assistance of Pearl Events and delicious catering by Royal Fig, they pulled off the wedding day they imaged! The couple opted for a first look, and the expression on Bob’s face is just absolutely priceless. Erin was absolutely stunning, and the energy between them was palpable! The ceremony did have to get moved inside due to a forecast for rain, but it resulted in a unique format where the guests seated at their dining tables, and the decorated chuppah was centered in-between everyone. The Jewish wedding ceremony took place under the chuppah after the private ketubah signing prior to the guests arrival. Bob stomped on the glass and the guests erupted in cheers and clapping. The wedding day was also an opportunity to honor their family, friends and their new family unit by joining together with Bob’s two children. The closeness between the families was very present, and I especially enjoyed Erin’s heartfelt toast thanking her sweet mother! It was an emotional day, but full of happiness indeed. Big congratulations Erin & Bob!